Umineko no Naku Koro ni Episode X: Rokkenjima of Higurashi Crying (うみねこのなく頃に EpisodeX -ROKKENJIMA of Higurashi crying-?) 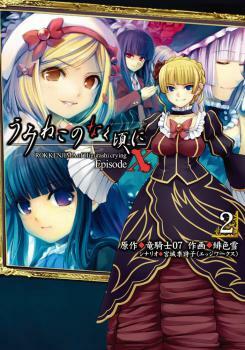 abbreviated as Umineko no Naku Koro ni Episode X, is a crossover manga featuring the cast of both Higurashi no Naku Koro ni and Umineko no Naku Koro ni. Umineko no Naku Koro ni Episode X takes place during the Ushiromiya family conference on a small, secluded island named Rokkenjima owned and lived on by Kinzo, the head of the wealthy Ushiromiya family. Kinzo is near death, and eight of his family members arrive on the island for the annual family conference, where the adults plan to discuss how Kinzo's assets will be divided once he is dead. Also on the island are three family members who live there, five of Kinzo's servants, and his personal physician. Battler Ushiromiya, one of Kinzo's grandchildren, has reconciled with the family after being estranged for six years. Battler arrives on the island one day later than everyone else due to school circumstances. While wondering why he can't hear any seagulls, Battler wanders towards a shrine located on the island. Battler notes that the shrine has been labeled "Furude Shrine", which confuses him. After a flash of bright light, Battler finds himself amidst the Watanagashi Festival, being welcomed by Mion Sonozaki, Rena Ryuuguu, Rika Furude, and Satoko Houjou. After being dragged into a takoyaki eating contest, Battler manages to escape from the group and sees another flash of light. He finds himself standing in front of the Ushiromiya Main Building. After walking around more, Battler encounters the rest of the Ushiromiya family. Battler notes that several family members are carrying unusual items; George is carrying a camera, Rudolf is carrying a baseball glove, and Kyrie is carrying a scrapbook. Furthermore, many of the family members appear to have empty looks in their eyes. Later, while eating dinner with the family, Battler spots Rena outside the building, mowing the lawn. After questioning a couple members of the family, Battler learns that both Jessica Ushiromiya and the servant Shannon hadn't been seen since that morning. Before he can do much investigating, Kinzo kicks Battler and the cousins out of the house so that the adults can have the family meeting. The next day, Battler can't find anyone in the Ushiromiya Main Building. He ventures outside and sees the Watanagashi Festival again. He spots the entire family participating in the Festival, all singing and dancing to "Beato's Marching Song". Battler soon learns that, not only have Shannon and Jessica not turned up, but his father, Rudolf, has also gone missing. Battler ventures into the nearby forest in search of the missing people and finds a strange fence. By following the fence, Battler eventually stumbles upon a bizarre restaurant, Angel Mort. Inside, he finds Shion Sonozaki, Shannon, and Satoko working at the restaurant. He also sees Rudolf dining at the restaurant, surrounded by the Chiester Sisters and the Seven Stakes of Purgatory. While bewildered by the circumstances, Battler is determined to find Jessica. Battler drags Shannon outside to question her about what is going on. Shannon requests that he not ask her any questions, stating that everything is due to the orders of the Golden Witch. Still confused, Battler spots a nearby newspaper stand. He looks at the paper labeled "Hinamizawa News" and questions why such a newspaper would be on the island. He notes that the date on the newspaper is June 20, 1983, contradicting the current date, October 6, 1986. Shion and Satoko claim that Rokkenjima is part of Hinamizawa and they both confirm the date to be June 20, 1983, further confusing Battler. Battler rejoins Rudolf inside Angel Mort and discovers a miniature Jessica performing music on top of a sushi roll. Jessica explains to Battler that, ever since October 4, Beatrice has cursed the Ushiromiya family and Rokkenjima, causing a number of strange people to appear on the island and causing a number of strange things to occur. Shion and Satoko approach Battler and encourage him to not think too hard about the bizarre happenings on the island. Battler and Jessica attempt to escape from Angel Mort but fall victim to one of Satoko's traps. Despite dealing with Satoko's traps and attacks from Shion, the two manage to escape the restaurant. The Chiester Sisters attempt to shoot him with their arrow but discover they can't lock onto him, causing them to suspect anti-magic interference. Bernkastel, Beatrice, and Lambdadelta are all seen in the Witches' Smoking Room, betting on the "Game" the Battler is in. Lamdadelta bets on Battler, Bernkastel bets that Lamdadelta will lose, and Beatrice bets against Battler. While hiding in the forest, Battler and Jessica are approached by Rena. Battler and Jessica escape the forest and make it back to the Ushiromiya Main Building and find the Ushiromiya family inside, worshipping Beatrice. The pair quickly leave the building and find Maria and Beatrice in the Rose Garden. Beatrice laughs at Battler and declares the island the new "Golden Land". She demands Battler submit himself to her or else she will erase him. This page was last edited on 6 March 2018, at 23:41.